After a rest at the hotel and a free cocktail at the bar (oh, and we had afternoon tea there as well!) we trotted off to find some food and see Hong Kong by night. Needless to say, it was a feast for the eyes with noises and smells from the sublime to the slightly scarey! There were neon lights everywhere you looked advertising tailoring, foot massage, herbal remedies etc, horns honking and people everywhere. 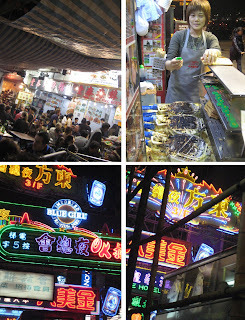 We also came across a night market, which was fun to look around, even if most of it was a lot of tat.